The Texas Stars (20-20-1-2, 43 pts, #13 Western Conference) saw their three game winning streak come to a crashing halt this week with two straight losses on the road. Friday night's game saw six goals against and the first pull for Andrew Raycroft on the season. The surging San Antonio Rampage (Florida Panthers) became winners of six straight with the W. League leading Oklahoma City (Edmonton Oilers) beat up on Texas on Saturday, throwing 44 shots at Raycroft for a 3-1 win. As the Stars hit the All-Star break, it is clear that there is a huge amount of parity in the bottom half of the standings. Only four points separate eighth from fifteenth in the West; in the East, it's just five. Absolutely no one is out of the playoff race at this point. By my math, the Stars need forty points in their final thirty-three games to keep pace with the current eighth place finisher. That's a record of 20-13, assuming no OT or SO losses, which have been rare for Texas this year anyways. Among those 33 games are 17 against the division, and only ten are against clubs not currently on pace to make the playoffs. The going's about to get real tough. For the moment, it looks like Texas gets to keep Tomas Vincour as Dallas recalled Philip Larsen today. Larsen will be the eighth defenseman on the roster in Dallas, though not all of them may be ready for action. Either Souray or Robidas could still need time and today's practice will tell us that. With Vincour staying, Dallas has reassigned Jake Hauswirth to Rio Grande Valley. The eleven games that Hauswirth played in Texas were more than I was ever expecting from the forward. He had one point on an assist in his AHL stint, playing mostly fourth line minutes. Hauswirth's assignment is probably good news on the injury front as Mathieu Tousignant has been working hard to return, and there were concerns for Colton Sceviour, who took a hard hit in Saturday's game. No official word on either, but I hope to get something as practices resume on Wednesday. In other news, Texas forward Matt Fraser will play in the AHL All-Star game tonight at 6:00 PM local time. Catch it on FSSW+, if you get that channel. The Dallas Stars announced on Monday that defenseman Philip Larsen has been recalled from the Texas Stars, Dallas’ primary affiliate in the American Hockey League (AHL). Dallas also reassigned forward Jake Hauswirth from Texas to the Rio Grande Valley Killer Bees of the Central Hockey League. Larsen, 22, has skated in 21 games for Dallas this season, scoring one goal and two assists in that span. The Esbjerg, DNK native ranks second among Dallas defensemen with a +7 rating and is averaging 17:10 of time-on-ice per game. Earlier this season, Larsen became the first Danish-born defenseman to score an NHL goal since Poul Popiel in the 1971-72 season for the Vancouver Canucks. The young defenseman has played in 12 games for Texas this season, setting up nine goals and racking up ten points. Dallas drafted Larsen with the 149th pick (fifth round) of the 2008 NHL Entry Draft. Hauswirth played in 11 games for Texas, setting up one goal for his first AHL point. He started the 2011-12 season with Rio Grande Valley, scoring six goals and adding seven assists for 13 points in 21 games played. The Dallas Stars acquired Hauswirth in a trade with the Florida Panthers on December 7. Dallas sent forward Krys Barch to Florida in exchange for Hauswirth and a sixth-round pick. The 6-foot-5, 215-pound right wing is in his third pro season, spending the first two pro years in the ECHL with Cincinnati and South Carolina. In all, the Merrill, WI native has played in 142 pro games, scoring 35 goals and totaling 76 points. It was a tough luck loss for Texas tonight as the goaltenders for both teams played spectacularly well. Raycroft had a whopping 42 saves on 44 shots and LeNeveu 22 of 23. I was unable to watch the game live, so I've posted the press release below. The Texas Stars (20-20-1-2, 43 points) were defeated by the Oklahoma City Barons (29-11-2-3, 63 points) 3-1 in front of 5,606 fans at the Cox Convention Center on Saturday night. Barons’ goalie David LeNeveu (11-5-2) stopped 22 of 23 for the win. 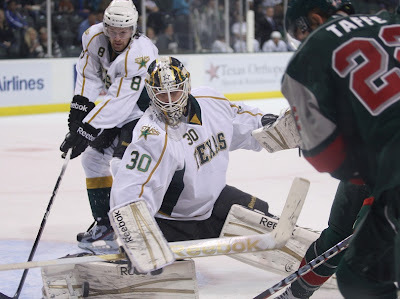 Texas goalie Andrew Raycroft (6-4-1) stopped a season-high 42 of 44 Oklahoma City shots in the loss. Oklahoma City scored early in the second period and early in the third period to push pas Texas. Barons’ forwards Ryan Keller and Hunter Trembley each scored, as did defenseman Dylan Yeo. The Barons head into the All-Star break with more wins and points than any other team in the AHL. 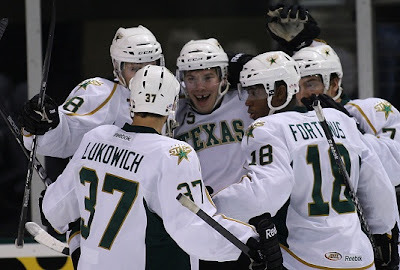 Texas left wing Francis Wathier netted the lone goal in the Stars defeat. The Stars visit Houston on Thursday, February 2nd at 7:35 p.m. at the Toyota Center. After a scoreless first period, the Barons opened the scoring at 1:39 of the second period with a power-play goal. Defenseman Dylan Yeo blasted a shot from the point, as Texas goalie Andrew Raycroft made the initial save. The rebound rolled in behind Raycroft for Yeo’s fifth goal of the season and a 1-0 Oklahoma City lead. Oklahoma City doubled its lead just 36-secopnds into the third period. Leading scorer Ryan Keller fired a wrist shot from the bottom of the left-wing circle, his 15th goal of the year slipped off the pads of Raycroft and into the Texas net for a 2-0 Barons lead. Texas cut the Barons lead in half at 2-1, as Francis Wathier snapped his ninth goal of year over the glove of David Leneveu. Tomas Vincour and Brenden Connolly each had an assist on the play. Oklahoma City’s Hunter Tremblay scored and empty-net goal with 13 seconds remaining for the 3-1 final score. No lines tonight, as I couldn't watch live. In a bit of bad luck for Texas, the Stars will face their second team on a five game winning streak tonight in Oklahoma City. This second night of the back-to-back will see the Stars playing the #1 Barons for the first time in over a month. The Barons are good, very good, but Texas is not completely out of the season series. In fact, both teams are 2-2-0-0 on the season against each other, not something you'd expect against a team that is nearly 18 points ahead in the standings. Oklahoma City has been a fantastic team this season. They are sending three players to the AHL All-star game and could have just as easily sent both of their goaltenders and half their roster. Overall, the Barons are a good measuring stick for Texas at this point in the season. As the Stars were crushed last night in SA, a good win against OKC could prove that the changes they have made over the past few weeks really are working and that game was a fluke. Despite nearly a week's rest, Texas's three game winning streak came to an end tonight at the hands of San Antonio Rampage, who extend their own streak to six straight. There really isn't a lot to say about a game that ends with a 6-2 final and was 3-0 after only the first period. Andrew Raycroft was pulled for the first time after allowing five goals on only twenty shots. Texas got goals from Tomas Vincour and Angelo Esposito. Esposito was one of few bright spots in the game, getting two points against his former club. The first period was rough for Texas as former Star Greg Rallo started things off with his 10th of the year. To finish off the period, the Rampage got two goals in the last two minutes: Scott Timmins tipping a Caruso shot and Repik shooting one home. Texas fought back a bit in the second as Tomas Vincour extended his long dormant road scoring streak to six games with his 11th AHL goal of the year. Angelo Esposito assisted against his previous team. New acquisition Jon Matsumoto wristed one home to set things at 4-1, regaining the Rampage's three goal lead. Esposito would get it back to a two-goal deficit to close the second, but the third period was all San Antonio. A goal from former Star Ondrej Roman chased Andrew Raycroft from the net. Beskorowany gave up a goal on his second shot against to Mark Cullen. Texas had a few scraps in the game from Wathier and Dillon to try to spark something. Coach Pyle shuffled the lines after the first period trying to find a spark for his club. Ultimately, Texas could not rally from the early deficit and ended with their first loss in nearly two weeks. Texas will head to OKC overnight to face the Barons tomorrow night. Early on in the year, San Antonio and Texas were both in trouble. Both clubs were on a downward slope with no end in sight; matchups between the two were frequently between the #14 and #15 teams in the conference. However, both teams have turned it around recently, and both teams have the same factor to thank for it. For Texas, we've documented it here before. The play of Andrew Raycroft since his assignment has been stellar. Currently 6-2-1 and basically completely responsible for Texas's current 6-2-1-1 record in the last ten, he is showing his skills at every turn with calm play and timely saves. On the Rampage side, Dov Grumet-Morris is the recent hero. After spending the beginning of the year in Norway, DGM was signed on a PTO and has since flourished in the Alamo City. In seventeen games, he is 11-5-0, garnering a 1.99 GAA and .931 SV%. Those numbers are good enough for #2 in the league among all goalies. Grumet-Morris has had several prior AHL stops, but his most notable was last year in Connecticut, where he got into twenty-two games for the Whale/Wolf Pack. DGM has played in ten straight games now with backup Andrew Volkening not seeing the ice in his current AHL stint. Both teams carry streaks into tonight's game. Texas has rattled off a season-high three in a row and San Antonio also has a season high with five, including victories over Rockford, Peoria, Abbotsford, and Houston (2). Also contributing for Texas, as Austinites know, is the Sceviour-Glennie-Wathier line. Some recent trades have kicked up the Rampage for the better in the offensive zone. Jon Matsumoto came over from the Charlotte Checkers and instantly had an impact with three goals and two assists in just three games. One Rampage player who will not be on the ice is Tim Kennedy, who was traded yesterday to the San Jose organization. Another big story for Texas is the assignment of Fraser, Vincour and Larsen. Vincour will slip into the lineup, but it's unclear where. The top two lines have been doing very well recently, so it will be interesting to see the lineup tonight. Philip Larsen will probably slip in as Brad Lukowich comes out of the lineup with no other changes. With Larsen available and Lukowich still feeling the effects of a bruised lung in last weekend's final game, it is likely that Larsen will replace Lukowich to give the captain a chance to heal up over an extended period. Blog (unofficial): Rampage with Tony U.
Dallas announced today that they have assigned Matt Fraser, Tomas Vincour and Philip Larsen to the Texas Stars. Fraser's assignment was expected as he was an injury callup to bolster the lineup against Anaheim last night, a game that Dallas won 1-0. Fraser will surely play in both games this weekend and attend the AHL's All-Star game on Monday. That's 22 players, leaving room for only one more. That means that either Larsen or Vincour will be left in the AHL for some time post All-Star break. Since there are already seven defensemen, my guess is Larsen stays in the AHL. That is tough for the young blue liner though as he just scored his first NHL goal last week and had been selected over the past week to play instead of vets Fistric and Pardy. For Texas, this is a huge boost. At the time of their callups, Vincour and Larsen were both top scorers for the Stars. Vincour was at thirteen points in fifteen games and Larsen a point a game player with ten in ten. If those paces continue, which is always an open question, that's an extra goal every other game. Another question for Coach Pyle is where to place them. Both of the top two lines have been clicking along this past week. What about trying Vincour with Garbutt and Schultz to add even more scoring punch to the third line? Larsen had traditionally been paired with Lukowich, and it remains to be seen if that persists and who becomes the scratch. Dallas has placed NHL All-Star Jamie Benn on the IR retroactive to January 14th and recalled AHL All-Star Matt Fraser in his place. While Texas is currently in the midst of a three game winning streak, Dallas is on a five game losing streak that has Coach Gulutzan upset and frustrated. "How do you deal with the problem? You have to make them aware that they are not good enough – with or without Jamie Benn and Mike Ribeiro in the lineup – to not be a hardworking team. That’s the message. They are just not good enough." So with that, Matt Fraser gets a chance to show that he is 'good enough' to make it in the NHL. He is the sort of player that Dallas could see fit to place in the top six of their lineup as they are missing Benn and Ribeiro for at least the next week. He could also get power play time as Coach Gulutzan has shown he is willing to do with a player like Larsen who demonstrated success with it at the AHL level. For Texas, this is a big blow. Fraser is the leading scorer and a member of the top line with Morin and Hedden. He plays big power play minutes with the Benn and four forwards unit. Texas will need to look elsewhere for scoring in his absence. Luckily, the Glennie-Sceviour-Wathier line has been heating up over the last month and is ready to fill that void. The callup comes at an opportune time for Texas as they don't play again until the weekend. It is possible that Benn could be back by then or that Fraser misses two games with Texas at most before the All-Star break. Finally, if Fraser is in the NHL at the time of the AHL All-Star game, an alternate representative will be chosen from Texas. 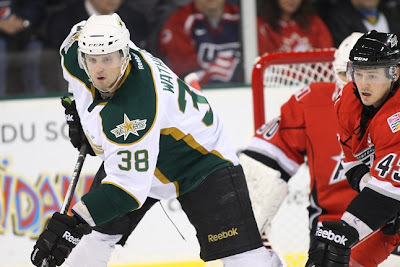 This happened last year when Travis Morin was in Dallas, and Francis Wathier went in his place. Morin might get another chance at the All-Star game this year if that is the case. He is 12th in the league in points and #3 in assists. Thanks to a determined third period effort and some silky smooth shootout moves, Texas went two games above .500 for the first time this season and put together a three game win streak for the second time this season. The win pushes the Stars to #10 in the West and a 6-2-1-1 mark in the last ten games. Stephen Schultz, Mike Hedden and Colton Sceviour got regulation goals and Andrew Raycroft had 22 saves and pushed his record to 6-2-1. "It just shows how hard these guys work," said Coach Pyle. "Our goal was to get the two wins [this weekend] if we could. The effort these guys put together in these two games is nothing short of phenomenal. They just never quit. Houston scored first in this one as Mike Radja collected his first AHL goal of the season. The Stars outshot Houston 14-7 in the period but did not score. "In the first, we weren't bad, but we weren't good either," said Pyle. Radja got his second of the year against Texas in the middle frame as well. A bit of a scramble play, Houston ended up with two forwards on the goal line against zero Stars defenders, making the tap in goal an easy one for Radja. The Stars waited until the end of the second to start the comeback. Stephen Schultz scored his seventh of the year and third of the weekend on the 5-on-3 power play, just before the penalty expired. "Schultz is a sniper. I need a righty out there to fit the chemistry of the power play. On the first power play goal, not too many guys can make that shot. He finds a way to get chances." Mike Hedden scored his second of the weekend, a shorthanded goal, just eighty seconds later. The goal was scored off a rush that really started before the power play had begun for Houston with their player coming out of the box behind the play. Hedden's net crashing play was deflated a bit as Houston went up 3-2 on the ensuing power play only 30 seconds later. The Stars needed a comeback in the third to make it to overtime in this one. It was Colton Sceviour on the power play, assisted by Max Fortunus and Jordie Benn. The winger's 8th of the year made it 3-3 and gave Texas a chance to get to OT. Once in OT, Texas had a close call as Ryan Garbutt took a high sticking penalty and the Stars needed to kill a 4-on-3 chance to make it to the shootout. Once there, Andrew Raycroft and the Stars forwards paired up to bring home a W for the sellout home crowd. "In the shootout, I'm kind of blind," said Raycroft, who stopped three of five shooters. "I don't know who these players are, so I'm just going out there to try and get in the way." Colton Sceviour scored on his "signature" move, and Hedden and Garbutt also potted So goals to make the final score 4-3. Texas is now tied in the season series with Houston at 4-4-0-0. They now have a long layoff until their next game, Friday at San Antonio. The team will get two days off after playing 7 games in 11 days. Texas captain Brad Lukowich blocked a high shot with his chest in the second period and did not return to the game. He was sent to get x-rays. Coach Pyle shuffled Stephen Schultz to the third line in place of Luke Gazdic for much of the second half of the game. The fourth line played sparingly in the third period. Today's attendance was 6,863, Texas's second sellout of the season. Houston and Texas meet in Cedar Park for the 8th of 12 meetings on the season this evening. Texas is looking to make it three in a row after defeating the Wolves and Rivermen already this week. Houston is coming off an overtime loss at home against San Antonio. For a bit of comparison, Houston is currently tied for its longest losing streak of the year at all of two games. If Texas beats them tonight, it will be their longest losing streak of the season at three. Just in from St. Paul...next to board the Wild's Wild Transaction Train are Matt Kassian, Jed Ortmeyer, Chad Rau, and Nate Prosser. Returning to Houston on the Wild's Wild Transaction Train are Casey Wellman and David McIntyre. Frankly, from the way the Wild have been playing, I wouldn't be too surprised if the Wild just send all of their NHLers to Houston and call up the entire Aeros squad. It's not like the AHL guys could do any worse in the NHL at the moment, right? Houston just signed Chris Clackson today as well, since they played last night's game with just 17 skaters (typical is 18). Overall, this is a good opportunity for a team that is on a roll to beat up on a good team that is struggling with unforeseen circumstances. Coach Pyle wants to play the same way that they did last night against Peoria, hard-nosed hockey and sticking up for each other. Aside from a brief sixty second lapse in the second period, the Texas Stars played one of the most complete team games of the season tonight in defeating the Peoria Rivermen 6-2 in Cedar Park. "After the road trip, we were worried about being flat," said Coach Pyle. "[Raycroft] made huges saves. [We got] big goals, and the power play and penalty kill were good again." Texas went 2/5 on power play and had a clean sheet of 0/4 on the penalty kill. AHL All-Star Matt Fraser chipped in four assists and Colorado College product Stephen Schultz had two goals, both on the power play. Andrew Raycroft came up big with a calm cool and collected 21 save performance in net. The Stars came out on fire in the first. Across the first twenty minutes, they established dominance in all three zones, getting to pucks first and just being all around hungrier for the game's first goal. "From our goaltending to our defensemen breaking it out to our forward scoring, we're establishing ourselves out there," said Schultz. They were rewarded when a 3-on-1 gave Maxime Fortunus his fifth of the year, assisted by Mike Hedden and Matt Fraser. The Stars finished the period with a 14-4 shots advantage. The two squads totalled five goals in a frenetic second period. Texas went first on the power play with Schultz tipping a point shot from Fraser to make it 2-0. Peoria battled back though and scored twice in the span of just 34 seconds. Cade Fairchild and Jonathan Cheechoo knotted things at two just 4:40 into the period. Coach Pyle knew the team would pull through though, "Lately this team has found a way to battle through those situations. It was a real character builder." Peoria would not score the rest of the way as Texas outshot them 13-7 in the second frame, adding two more goals in the period. Mike Hedden scored the eventual game winner barreling down the slot and accepting a Fraser pass for the 3-2 lead. Glennie and Sceviour decided to do the same and Glennie potted his ninth of the season with a similar move five minutes later, ending the period at 4-2 for Texas. The Stars got two special teams goals in the final period to seal things up. Stephen Schultz got his second of the night and sixth of the year on the power play with a mad scramble in front of the net getting over the line for a 5-2 advantage. FInally, with just 65 seconds left in the third, Ryan Garbutt scored shorthanded to make the final 6-2. Texas had three fights in the game and really seemed to be playing together as a group more than before in the seaosn. "As a team, everyone is backing each other," said Coach Pyle. Schultz added: "This has been a close-knit team since day one". Andrew Raycroft has been a calming positive influence on the club since his assignment to Cedar Park, according to both Schultz and Pyle. "Anytime you have an 8-10 year NHL vet goalie, it calms things down a bit," said Schultz. Coach Pyle intoned the same: "He's great in the locker room. When he says stuff in the locker room, which he does, guys listen. He adds energy and experience and he's been great since he's been here." Texas captain Brad Lukowich left the ice during the first period after a check to the head from Peluso. He returned in the second with a bruise over his eye and finished the game, collecting a plus-3 rating. Texas returns home this evening after a four game road trip to face the #8 seeded Peoria Rivermen. Tonight's game will be Peoria's last visit to the Cedar Park Center for the 2011-12 regular season. Their previous visit on October 22nd end in a 6-5 OT win for the home club and afterwards degenerated into a full team scuffle at center ice. Texas went to Peoria five days later, losing in regulation 5-3. Cedar Park Center fan 'favorite' Ben Bishop is the big man in net for the Rivermen this season. After seeing Jake Allen usurp much of his starting time with a fantastic rookie season, Allen is 3-9-1 with a 3.49 GAA and .901 SV%. Bishop has rebounded himself with a 17-10-0 record, 2.17 GAA and .932 SV%. It has to be disappointing for Bishop, who played his junior hockey in Texas, to see Blues goalie Brian Elliot signed this week through 2013-14. With Jaroslav Halak, the Blues are set in net until the summer of 2014. Bishop is on a one-year contract with RFA status at the end of the season. Is he trade bait if the Blues want a piece coming down the stretch here? Perhaps. He's earned a shot at the NHL, but it doesn't look like it will be in St. Louis. T.J. Hensick leads all Rivs on offense with 14-33-47. The next closest point-getter is Brett Sterling (16-18-34) followed by Derek Nesbitt (14-14-28). For Texas, Travis Morin continues to lead the pack in points at 34, but Fraser isn't far behind at 31. Twenty-one of those are goal which ties him for second in the league among all players and among rookies. Jordie Benn is also tied for second among defenseman scoring with eight goals. Interstingly enough, Maxime Fortunus leads all defensemen in the league with three game winning goals. That's pretty good, considering he's only got four goals on the season total. Despite their current 12th place ranking in the standings, both by points and percentage, the Stars are in better shape for the playoffs than in may seem. By my math, they are right in the thick of it with Peoria, Hamilton and San Antonio. They need a 22-15 record (or something else that gets them 44 points) from here to keep a one point lead on the current 8th place pace (82 point pace + 1) over 76 games. Texas finished off their four game road trip with a 2-2 split thanks to a three goal second period in Chicago this evening. A two-for-two power play effort and near flawless PK sent the Stars to a "W" before 3,032 fans at the Allstate Arena. Jordie Benn extended his scoring lead among defenseman with his eighth of the year as Fraser did the same among all players with his 21st. Andrew Raycroft had 23 saves on 26 shots. Chicago opened the scoring in this one just three minutes in as Nathan Longpre wrapped around the Texas net to beat Andrew Raycroft for his seventh of the year. Texas jumped on the power play at the five minute mark after Victor Oreskovich delivered a check to the head of Mike Hedden. Hedden did not miss a shift but Oreskovich hurt himself in the process went to the locker room. Brad Lukowich found twine on the ensuing power play with Francis Wathier screening out Eddie Lack in front. Linemates Glennie and Sceviour picked up the assists on the power play goal. Shots ended at 10-10 in the period as the score was tied at one. The Wolves once again scored first in the second period. Jordan Schroeder finished off a two-on-one with a one timer to beat Raycroft at the 2:45 mark of the period. Texas answered right back 23 seconds later. Jordie Benn snapped a wrister from the top of the circles to tie things at two a piece. Jake Hauswirth and Brendan Connolly both picked up their first assists with the Stars on the goal. The Stars were not done in the period yet though. Just before the 14 minute mark, Matt Fraser tallied his 21st of the season, this one at even strength. Mike Hedden sent a glorious cross-ice pass to Fraser's stick, which he finished off in typical fashion. Just under a minute later, with Texas on the power play, Max Fortunus sent one low on Lack for his fourth of the year. The Stars outshot Chicago 15-6 in the period to take a commanding 4-2 lead overall. Chicago got a third goal in the third period on the power play late. Mike Duco scored with a 6-on-4 advantage to set things at 4-3 for Texas, but a minute of 6-on-5 would not give Chicago the game tying goal. The Wolves and Stars meet for the third of four this season and the last in Chicago as Texas round out a four game road trip. For Chicago, this is the final game of a six game home stand, on which they have gone 4-1 so far. After going 6-0 against the Wolves last season, Texas is 0-2 against this year's iteration, each game a regulation loss. Darren Haydar and Mark Mancari lead the Wolves on offense. Each is a point per game player or better on the season. Kevin Connauton leads the power play pack with six PPGs. The Wolves are #11 on the PP at home (19.5%). They are #2 in the league on the home PK at 89%. They are far worse on the road at #22 with 79.3%. In other random stats, the Wolves have outscored their opponents in both the first and second over the course of the season but are outmatched 25-32 in the third period. This has contributed to an 0-10 record when trailing after two. Of course, leading after two they are a stingy 19-2. Essentially, as is the case in most games in the league, after two periods you might as well pack up, because the team that's up is winning that game. To be exact, 85% of the time in the AHL this season, the team ahead after two walks away with two points. 94% of the time they get at least one. The team down after two loses in regulation 76% of the time and gets a point just 9% of the time. Goaltending for the Wolves features a familiar pair. Matt Climie is the clubhouse leader with 12-5-0 record, 2.44 GAA and .927 SV%. Second year pro Eddie Lack is behind him at 9-9-3, 2.58 GAA and .917 SV%. These are a drastic improvement over his early season numbers, which showed his struggles coming in. As Lack recovered, the two have been splitting starts pretty equally, each with five starts since the Christmas break. Texas returns Francis Wathier for tonight's game, sure to be a boon to the offense and defense alike. Coach Pyle will get to reunite the vet winger with rookie Glennie and third year man Sceviour hoping to rekindle some of their scoring touch from earlier in the month. Texas Stars Report: Trending Up? It was yet another up and down week for the Texas Stars (17-18-1-2, 37 pts, #13 Western Conference). Texas went 2-2 on the week but in uneven fashion, winning against one of the best teams in the league and losing to the absolute worst. Consistency has been an issue all season for this club and it is now exacerbated by losing a key veteran piece in Francis Wathier. The biggest storyline of the week has been the play of Wathier and his linemates, Colton Sceviour and Scott Glennie. All three are of particular interest to Dallas fans, none more so than first round pick Glennie. With the high pick, high expectations were set. Glennie has finally started to evolve his game to resemble what scouts saw in Brandon of the WHL. Coach Pyle definitely points to the concussion early season and some systems work that needed to be done as the reasons for the slow start. In the last six games, Glennie has eight points (4g, 4a) including two three-point efforts. Colton Sceviour also picked up his game over the past few weeks. In the ten games since Christmas, Sceviour has four goals and eleven assists, including two game-winners. He's coming up all over the scoresheet and in clutch situations. Wathier, not to be outdone, is quietly having a career year. He is team-best plus-10 as well on a team that has struggled in that area. The next player behind him in that category is vet Brad Lukowich at plus-5. With Tomas Vincour coming off the IR today, Francis Wathier was assigned to Texas this afternoon. By my count, that still leaves Dallas with just 12 forwards, so I'm not sure about this assignment. 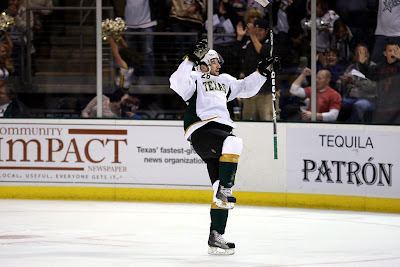 However, Texas will certainly welcome Wathier back to the lineup after missing him in Monday's game against Rockford. Bachman gets the start tonight for Dallas. The Dallas Stars announced today that the club has activated Tomas Vincour from injured reserve and assigned Francis Wathier to the Texas Stars, Dallas’ primary affiliate in the American Hockey League (AHL). Vincour, 21, has missed the last 14 games with a lower body injury after being placed on injured reserve retroactive to Dallas’ game on Dec. 15 against the New York Islanders. The 6-2, 204-pound forward has skated in 14 games for Dallas this season, recording one goal and two assists for three points. He has been an even or plus player in 11 contests for the Stars so far this season. Wathier, 27, went scoreless in his lone game with Dallas registering three hits in 5:25 of ice time. He leads the Texas Stars (AHL) with a +10 rating in 37 games, accumulating eight goals and 15 assists for 23 points. For the first time on the season, Texas failed to score a goal as simple but effective goaltending for Rockford got the job done this afternoon in Illinois. The 2-0 score is really deceiving as the game was closer than that. Both teams traded quality chances throughout the contest with both tenders getting solid stops. Texas was outshot by the IceHogs 13-9 in the first period, but neither team could score as the teams traded power play chances but played mostly at even strength. After taking the two penalties on the afternoon to that point, it was Brandon Svendsen breaking up the scoreless tie. Brandon Pirri threaded a puck through several Stars defenders and found Svendsen open alone on Raycroft's right side. He would not miss the open net to make it 1-0 for the Hogs. Texas gave the Hogs two more power play opps in the period, but neither would go for Rockford. Shots in the period were 11-8 for Rockford. The Stars outshot the Hogs in the final period 16-10. It was a late period penalty by Angelo Esposito that put things out of reach for the Stars. With Esposito in the box, Jeremy Morin tallied his 9th of the year for the IceHogs and pushed the advantage to 2-0. Texas would get a late power play to go 6-on-4 with Raycroft on the bench, but it wouldn't come to pass. Texas will travel to Chicago for a Wednesday night game before returning home for the weekend. It's a 1 o'clock game, so if you'll excuse references to "today" and "yesterday", I'm publishing a little early to make sure everyone can read before the game. It's only January and yet the Texas Stars are already starting to finish out the season series against some teams. Today, they will close the book on their series with the Rockford IceHogs in a matinee game between the two in Illinois. These two teams tangled last weekend in Cedar Park with Texas winning one in regulation and Rockford taking the second in OT. Both games were imminently winnable for the Stars. Texas has claimed five of six points available against the Hogs and needs to make it seven out of eight to keep themselves afloat in the playoff race. After idling on Sunday, Texas was leapfrogged by several teams to drop them from #10 to #13 in the conference. And just as they were beginning to pick up steam, Dallas's injury woes got worse. Mike Ribeiro's "nothing" injury turned into a knee problem that will keep him out until after the All-Star break, and Jamie Benn had an emergency appendectomy that will keep him out for at least ten days. Francis Wathier has already been recalled and another forward, mostly likely a center like Travis Morin, should be expected to be called. Dallas has only playing 12 forwards tomorrow in St. Louis. Since last weekend, Rockford has been on a road swing, losing to Chicago and San Antonio but defeating the league leaders, OKC, in overtime 2-1. That shows how dangerous this team is, and they cannot be looked past. Luckily for the Stars, they traveled overnight on Saturday and spent Sunday resting up and watching some football to make sure they have fresh legs for their game today. The continued success of Colton Sceviour and Scott Glennie could be affected by the Stars' callup of Wathier. It will remain to be seen. Additionally, Texas could welcome Angelo Esposito to the team for his first game. Esposito will wear #16. Other Stars to wear #16 include Michael Neal, Fabian Brunnstrom and Sean Backman. The Dallas Stars have recalled Francis Wathier from the Texas Stars today as the forwards in Dallas are battling the flu and Mike Ribeiro is expected to be out until after the All-Star Break with a knee injury. Wathier has quietly been having a career year in Texas. In addition to being on a pace for a career-high 47 points, he is plus-10 on a team that has battled to keep the puck out of the net at times. He is a veteran leader on the team and is deserving of a callup. The hope now is that due to his two years with Coach Gulutzan in Cedar Park, he gets to see time on the ice in Dallas instead of in the press box. The Dallas Stars announced today that the club has recalled forward Francis Wathier from the Texas Stars, Dallas’ primary affiliate in the American Hockey League (AHL). Wathier, 27, has skated in 37 games for Texas this season, accumulating eight goals and 15 assists for 23 points. He currently leads the AHL club with a +10 rating and is tied for second with 57 penalty minutes. The 6-4, 218-pound forward from St. Isidore, ON has been held scoreless in eight career NHL games with Dallas, registering four shots and five penalty minutes in that span. Wathier was Dallas’ sixth-round selection (185th overall) at the 2003 NHL Entry Draft. Whenever the Admirals and Stars tangle, the only time the differential is more than one is when there's an empty netter. Even though both clubs have changed coaches since last season, Texas and Milwaukee's low-scoring nature really comes out against each other. Tonight's game was no exception. Texas got a goal from Mike Hedden, but Milwaukee collected two in just 75 seconds in the first. That was the difference. Texas ends its four game point streak, and Milwaukee broke a three-game losing skid with the W.
With Francis Wathier in the box, Juuso Puustinen got things started for the Ads in the first period, beating Andrew Raycroft over the left shoulder for his 13th of the year. Only 75 seconds later, Joel Champagne added his fourth of the season to set the score at an early 2-0 advantage for Milwaukee. Champagne's goal came on the rebound of an initial Ryan Flynn shot. As the first wound down, Mike Hedden cut the lead to 2-1 for Milwaukee as his fourth of the season found twine. The hot hands of Colton Sceviour assisted on the play. Milwaukee outshot Texas 12-11 in the period. The second and third period were mostly quiet, traditional low-scoring fair between these two teams. Texas outshot the Ads 9-5 in the second but neither team tallied a goal. Texas got a late chance the Joel Champagne in the penalty box but could not convert on the power play. Francis Wathier took a cross-checking penalty with just 49 seconds left to seal things up for the Milwaukee Admirals. Jeremy Smith finished with 22 saves in the contest and Raycroft with 23. The Stars are next in action against the Rockford IceHogs on Monday afternoon. Coming off two big wins, the Stars rumble into Milwaukee this evening for their second and final game in Wisconsin this regular season. The former division rivals will only faceoff four times this season with both contests in Cedar Park coming back-to-back in early February. In one previous meeting on the year, the Stars cruised to a 5-3 matinee win, riding a 50% PP effort, perfect PK and solid goaltending. Sounds like the exact same combination Texas would want again tonight against the Ads. The Stars enter this game on a four-game point streak and with a 5-3-1-1 record in the last ten games. Their win last night was big in so many ways. It was not only a come-from-behind victory, something that has been dreadfully rare for all three iterations of the Texas Stars, but it got Texas above .500. It is helpful to remember how spoiled the Stars' fan base has been previously. Aside from Texas's 0-1 record to start the 2009-20 season, this season was the first time that the Stars were under .500 for longer than one game. By my math, Texas needs 23 wins out of 40 remaining to get themselves to the playoffs from here. Those aren't bad odds. The odds get even better when you see that Texas has manufactured three solid lines that can score goals. Sceviour-Glennie-Wathier is scoring at an insane pace while Fraser-Morin-Hedden features two of the top scorers in the league and some grit from Hedden to boot. Connolly-Garbutt-Sawada could be broken up due to injury but Garbutt and Sawada have both performed well this year, and the Stars look to have a winner in Connolly. Angelo Esposito will join the lineup for tonight's game, the first Texas Stars midseason trade acquisition. My guess is that he will displace Hauswirth, if he makes it to Milwaukee in time. The Admirals come into tonight's game having dropped their last three contests against Charlotte, Peoria and Chicago. The Ads had Jeremy Smith in goal last night and are playing a three-in-three this weekend, so it's a tossup if Smith or Engren make the start against Texas. Smith is the stud in net for Milwaukee going 16-6-1 with a 2.23 GAA and .918 SV%. Engren is sporting a 3-5-0 record with a 3.11 GAA and .890 SV%. Familiar face Chris Mueller leads the Ads with 15-11-26 in 32 games. Juuso Puustinen follows him with 12-11-23 in 34 games. Rookie Michael Latta rounds out the top three with 11-12-23 in 34 games and a gaudy plus-14 rating and team-leading 60 PIMs. He is not even the best plus-minus on the team as defenseman Tyler Sloan clocks in at plus-18. The other half of the dynamic duo from last year's playoffs, Gabriel Bourque, is currently with the Nashville Predators and scored his first NHL goal in a loss to the Dallas Stars last week. On the coaching side, the last time Texas played the Ads it was Kirk Muller behind the bench for Milwaukee. Muller has moved on to the NHL's Hurricanes and Ian Herbers is at the reigns now. Under Muller, the Ads were 10-6-0-1 and under Herbers they are 10-7. For the first time since November 11th, the Stars are above .500 thanks to some fantastic work from Scott Glennie, Colton Sceviour and Francis Wathier. Glennie potted two goals, including the game winner, and added an assist while Sceviour assisted three times, including the primary on the game winner. Wathier picked up the Gordie Howe hat trick with a goal, an assist, and a fight. This was a big win for Texas in all kinds of ways. It was a comeback win that showed this team has the character to stay in games no matter the deficit. The game started off with a bang as an unexpected shot from the right wing circle by Willie Coetzee beat Raycroft clean for a 1-0 Griffins lead. The goal was scored on the first shot of the night for either team. Greg Amadio ran Colton Sceviour just five minutes into the period, earning himself a five minute major and a game misconduct for interference. Texas cashed in on the ensuing power play twice but not without giving up a shorty. Ryan Garbutt tipped a Maxime Fortunus shot to tie things at one. Two minutes later a two-on-one breakaway from Andersson and Gustav Nyquist led to a shorthanded goal for the Griffins with Andersson finishing it off to make it 2-1. Only thirteen seconds later, it was Texas getting the tying goal on the power play. Scott Glennie finished off a nice cross-ice pass from Colton Sceviour to make it two all. Brad Lukowich had the second assist on both power play tallies. Still in the first period, Grand Rapids put two more up. The Stars allowed a 4-on-2 rush and former Star Chris Conner made them pay, setting things at 3-2. Griffins leading scorer Gustav Nyquist added another to his goal count to make it 4-2. Only then did the first end. Shots were 15-8 for Texas and the Griffins scored on half of their shots in the frame. The second period belonged to the Stars. The shots were more even but Texas was the club making them count. With Travis Morin in the box for hooking, Matt Fraser added his second shorthanded goal in as many games to extend his goal scoring lead to twenty on the season. Speedy center Ryan Garbutt assisted on the play. Four minutes later, Francis Wathier absolutely obliterated a shot, going roof on Tom McCollum for the game-tying goal. Shots were 14-13 for Texas again in the second. As many Griffins fans were still finding their seats to start the third, Scott Glennie popped home his second of the night and eighth of the year only twenty-one seconds in. The goal set the score at 5-4 for Texas. The Griffins took two minor penalties in the last six minutes of the game, setting them at a distinct disadvantage to even the score at five. With seventy seconds left, Griffins tender Tom McCollum would be pulled for the extra skater. Travis Morin would add an empty netter with just one second left to seal the win. Ray Sawada played in his first game in ten contests but left the game in the second after a rough hit and did not return. The Florida Panthers and Dallas Stars traded minor league forwards this evening during the Texas Stars game in Grand Rapids. Ondrej Roman is on his way to the Florida system, where he will likely play with the San Antonio Rampage. Texas will receive Angelo Esposito, former first round pick of the Pittsburgh Penguins. Esposito has played in Chicago and San Antonio in the AHL. Esposito's most notable career achievement is likely scoring the game-winning goal at the 2009 World Junior Championships to secure the gold medal for Team Canada. For both players it seems like a trade where the teams are hoping that a change of scenery would improve their performance. Both have dipped down into the ECHL this season for a few games, and I don't project either as NHL prospects at this point in their careers. Texas and the Rampage face each other six more times on the season, four of those in Cedar Park. The Dallas Stars announced today that the club has traded left wing Ondrej Roman to the Florida Panthers in exchange for center Angelo Esposito. Esposito, 22, has played in 16 games for the San Antonio Rampage of the American Hockey League (AHL) this season, collecting two goals and three assists totaling five points and eight penalty minutes. Prior to his professional career, Esposito spent parts of four seasons with the Quebec Ramparts and the Montreal Juniors of the Quebec Major Junior Hockey League (QMJHL). He scored the game-winning goal at the 2009 World Junior Championships to secure the gold medal for Team Canada. The 6-0, 190-pound forward from Montreal, QC was selected by Pittsburgh as the 20th overall pick in the 2007 NHL Entry Draft. 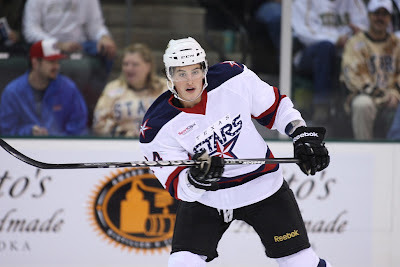 Roman, 22, has spent the majority of the season with the Texas Stars, Dallas’ primary affiliate in the AHL collecting one goal and four assists totaling five points and four penalty minutes with the club. The 6-0, 185-pound forward was selected by Dallas in the fifth round (136th overall) in the 2007 NHL Entry Draft. The Stars begin a four game road swing against the North and Midwest division with tonight's game against the Grand Rapids Griffins. The Detroit farm club has not faced off against the Stars since March 26th of last year and will face Texas four times this year, heavily backloaded in the schedule to March and April. The Griffins come into tonight's game after losing to the Aeros in a shootout on Thursday. Grand Rapids is on a seven game point streak, going 3-0-3-1 over that time. Texas is on a four game point streak of its own at 2-0-1-1. Forward and AHL All-Star Gustav Nyquist leads the Griffins on offense and ranks 17th in the league with 9-23-32. For comparison, Travis Morin is tied with him with 32 points via four goals and 28 assists. Tomas Tatar (10-19-29) and Jamie Johnson (14-13-27) follow Nyquist on offense. 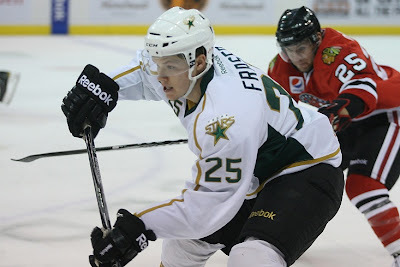 Former Stars Chris Conner (8-17-25 in 21 games) and Fabian Brunnstrom (2-5-7 in 12 games) also dot the roster. The Griffins are currently nursing an injury in net. Jordan Pearce sprained his ankle in a 3-2 OT loss to the Peoria Rivermen on December 30th. Joey MacDonald is the starter regardless, going 8-8-2 with a 2.78 GAA and .906 SV%. Tom McCollum was called up from Toledo and has garnered a 6-3-0 record on the season with 2.78 GAA and .909 SV%. The Griffins ranks 22nd on the power play at 16.2% and 16th on the PK at 82.5%. Grand Rapids is 10th in the league in penalty minutes with 17.71 per game. Garnet Exelby leads the club and is third in the league with 119 PIMs. On Texas's side of things, the Texas Stars Report had previously discussed what the Stars need to catchup with the pack. After the Stars' win on Wednesday, not much has changed. In the remaining 41 games, Texas needs to go 24-17 (or some combination that gets them 48 points such as 22-15-2-2) to catch up with the pace that the eighth place Rochester Americans are setting. A good swing through the other two divisions would be a good start. Really anything to get Texas away from the West Division would help right now. It starts tonight with the Griffins. The Texas Stars announced today that the club has assigned defenseman Jace Coyle to the ECHL's Idaho Steelheads. He will join the Steelheads on their road trip in Utah as Texas travels to Grand Rapids today via Chicago. Between Coyle and Labrie, either one or both were intended to spend the majority of the season in Idaho. Both have spent extended time with Texas due to injuries in Dallas including Philip Larsen, Sheldon Souray and Stephane Robidas. Hubert Labrie made the most of his callup and has played a hard-nosed game to earn a spot on the roster nightly. Coyle still needs more seasoning in the ECHL, where he performed well previously. This leave Texas with the following blue liners: Fortunus-Lukowich, Benn-Spang Dillon-Labrie, and Berube. The Texas Stars announced on Thursday that defenseman Jace Coyle has been reassigned from the Texas Stars to the Idaho Steelheads of the ECHL. Texas is Dallas’ primary affiliate in the American Hockey League (AHL) and Idaho is Dallas’ ECHL affiliate. The rookie defenseman has split time between Idaho and Texas this year, recording an assist in 17 games with the Stars this season. He also spent three games with Idaho in early December, setting up one goal for his lone ECHL point. The 21-year-old spent the last three years playing for the Medicine Hat Tigers of the Western Hockey League (WHL). The 5-foot-11, 185-pounder enjoyed his best WHL in 2009-10, setting up 36 goals and totaling 46 points in 68 games played. In 241 WHL games from 2007-11, Coyle scored 25 goals and totaled 107 points. The undrafted defenseman attended training camp with the NHL’s Dallas Stars in 2011 and played for the Stars in the 2011 Traverse City Prospects camp. As we have previously documented here, the Chaparral Ice hockey rink at I-35 is officially closing the doors this weekend after 15 years in the Central Texas area. The rink, which once featured Austin Ice Bats games, has been the home of amateur league hockey in Austin for many years. It is safe to say that the Ice Bats and Chaparral laid the foundation for the Texas Stars making it to Cedar Park. To celebrate their time here in Austin, the Chap Ice is holding a customer appreciation event this weekend. See the details below for more information. The Chap Ice will be sorely missed. Well, the time has finally come. The I-35 location is officially closing the doors for good Sunday, January 15, 2012. To celebrate all the years of patronage you have given us, we are hosting a customer appreciation party Sunday, January 15 with food and many events scheduled throughout the day. All the food and events are free. The only catch is that we ask that you RSVP back to the following link (https://registration.pointhog.com/Chap/RSVP.aspx) if you plan to attend the skate party between 1:00 and 4:00 pm so that we know how much food we need to get. If you want to attend any of the stick and pucks or drop-ins scheduled (see below for specifics), please call the I-35 front desk to be put on the list. Please call in advance as spots may fill up fast. Pro-shop hours are Mon-Fri 5-9 pm and Sat. from 12-5pm. Some strong defensive play and a little bit of puck luck put the Texas Stars past the Abbotsford Heat for the first time this season tonight in Cedar Park. The game had the looks of a goalie battle early as both teams were scoreless through the first. "We focused on being on the defensive side of pucks and waiting for our opportunities and taking advantage of them," said Stephen Schultz, who potted one in the game off an opportunistic bounce. Colton Sceviour collected the game winner with just 11.7 seconds left in the third period. "The puck turned over somehow. I was yelling for it, and [Glennie] threw it to me," said Sceviour. "I made sure I could hit the net, and it went right where I wanted it to." The win puts Texas back at .500 for the season. Texas and Abbotsford skated to a scoreless first as Texas outshot the Heat 11-2 through the first 16 minuntes of the period. Abbotsford caught up in the last four minutes to finish at 11-8 shots advantage for Texas. The games first goal didn't come until the last 64 seconds of the second period, in fact, when Danny Taylor fumbled a puck in his glove, dropping it and allowing Stephen Schultz to pot his fourth of the year unassisted. It was a good Johnny-on-the-spot play for the rookie forward, who has been thrust into more and more offensive situations with callups and injuries. Danny Taylor would actually be pulled for the third period despite stopping 33 of 34 shots against in the game. There was no indication of injury to the tender. A similar play would tie the score as Andrew Raycroft mishandled a puck and allowed Quintin Laing his tenth of the year at the eleven minute mark of the third period. Once again locked in a tie, Texas battled it out with defensive hockey to hopefully push the game to OT. "Any time you give up one goal against there's a pretty good chance we're going to win or at least get a point," said Sceviour. It was Sceviour who was the game's hero and number one star. Skating down the right wing with Scott Glennie, a turnover generated a two-on-one. Sceviour pasted one to the top-right corner of the net with just 11.7 seconds left. Texas held on through the last few seconds, aided by a Heat penalty for throwing a stick on the ice from the bench, to win 2-1. As to what was different in this game, Texas targeted the top line of the Heat for matchups. "They barrage you with hits to take advantage," said Sceviour. "We were able to get our matchup with their top line. That top line with Kolanos, Walter and Rheault is a big component getting a lot of offense for them." Texas now travels to the Midwest to play Grand Rapids, Milwaukee, Rockford and Chicago. They will try to play the same game as they did tonight against the Heat to collect some much needed wins. Matt Fraser felt under the weather, tried things out in warmups and wasn't feeling well enough to go tonight. With seven healthy defensemen, Dallas decided to assigned blue liner Jordie Benn to the Texas Stars. Benn appeared in two games for the Stars, notching his first NHL point against Detroit on a Michael Ryder goal that was also assisted by his brother, Jamie. Jordie finished even in his stint. He returns as the Texas Stars leading defensive scorer despite his absence. In addition, according to Cap Geek, he banked $32,000 in his stint at the NHL level. Not bad at all and well deserved for a talented undrafted defenseman who started his career in the CHL. Benn is not expected to be in the lineup, however, for the Stars tonight as the big club was in Anaheim last night. It's been a bad beat for the Texas Stars against the Abbotsford Heat this season. Texas is 0-3-0-1 against the boys from BC this year with their only point coming at Texas on November 11th, the first game between the teams. Since then, Texas is 0-3 against the Flames farm team, being outscored 10-5 in those games. When Texas began the series against the Heat, it was all about Leland Irving in net and Krys Kolanos up front. Kolanos continues to dominate the offense for the Heat, ranking 6th in the league with 17 goals and 21 assists in only 27 games played. However, Irving is up with the Flames, stopping pucks behind Kipper in Calgary. That doesn't mean that the Heat's netminding has suffered. Danny Taylor has stepped in admirably, going 8-3-0 with a better than Irving 2.02 GAA and .940 SV%. Joni Ortio has continued to get only backup minutes, losing all three decisions he has been in and hitting a 3.07 GAA and .869 SV%. Taylor has made the most of his callup for sure. The Heat are good on the power play and the penalty kill, ranking #10 (19.7%) on the PP and #2 (87%) on the PK. Texas's PP has been trending downward (#6, 20.9%), not hard to do after clipping along at >33% early in the season, but the PK is trending majorly upward. After starting the season in 29th in the league, Texas is up to 13th in the league (83.1%). It has become an important part of the Stars' game, as Ross showed us yesterday. Texas is 3-12 when they allow a power play goal against and 12-7 when they don't. Surprisingly for many who followed the success of the power play in the early season, the PK is a more reliable indicator of success for the Stars. So how do you make this a W? Obviously strong PK is a great start. It's even better not to need your PK if you can avoid penalties, especially "stupid penalties" like the one that sent Texas to a loss in OT on Sunday. The PP isn't as important, but it doesn't hurt. Abbotsford crushed the Rampage last night 5-0. It would be nice to stop the trend of allowing two first period goals as well. The Heat will suffocate you if you let them. Just three games were on the schedule for the Texas Stars (15-16-1-2, 33 pts, #14 Western Conference) this week, and the Stars got four of a possible six points. It's been a rough year so far for the Cedar Park faithful, so Stars' fans will take the points even if three of the four come against the worst team in the league, the Rockford IceHogs (Chicago Blackhawks). Right now, Texas sits in the 14th spot in the conference. Doing the math, Texas will need to improve their winning percentage from .485 to .583 to make up for their current deficit and pull into the 8th seed by the end of the season. That's a 25-17 mark for those keeping track at home. It wouldn't be impossible if not for their record against the West Division, the teams they face the most. The Texas Stars announced the signing of center Brendan Connolly today to a professional tryout contract. Connolly is a spark plug type player who skates fast and scores goals for the Greenville Road Warriors. He is a third year pro and finished plus-28 in last year's season, earning him the ECHL Plus Performer of the Year Award. That's a good attribute on a team that has struggled to keep the puck out of the net. He's a smaller player but it hasn't hurt those goal and assists totals at 20 goals and 23 assists for the year in just 31 games. He has previously played with Adirondack in the AHL, skating in three games recording no points. 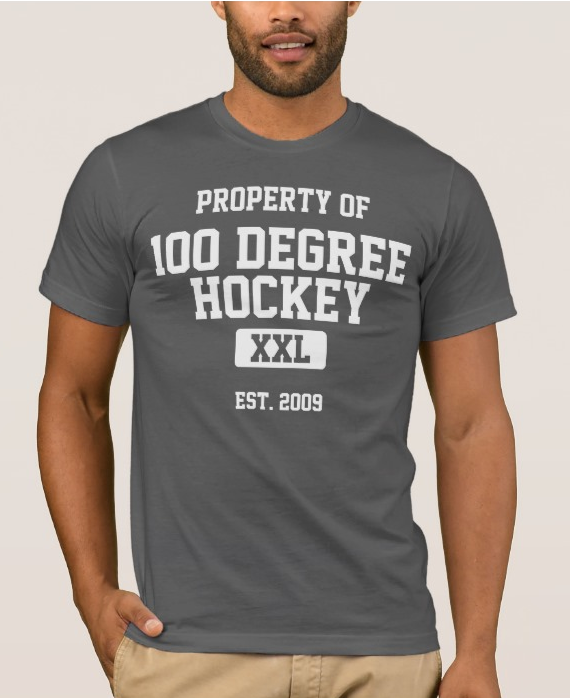 He played his collegiate hockey at, stop me if you've heard this one, Ferris State. Previous Texas players to lace up their skates at FSU include Greg Rallo, Cody Chupp and Mike Embach. The Texas Stars announced on Tuesday that the team has signed forward Brendan Connolly to a PTO (professional tryout agreement). Connolly is currently third overall in the ECHL scoring race, potting 20 goals and dishing out 23 assists for 43 points in 31 games with Greenville. Connolly leads his team in goals, assists, points and penalty minutes (121). Overall, Connolly is second in the league in goals, fifth in assist and seventh in penalty minutes. The 5-foot-7, 175-pound forward is in his third full season of pro hockey, spending the bulk of his career in the ECHL with Greenville and Elmira. The Canmore, AB, native has suited up 143 times in the ECHL, scoring 61 goals and totaling 132 points. In 2010-11, Connolly played in three games for Adirondack of the AHL, going scoreless in his time with the Phantoms. Prior to turning pro, the 26-year-old played four seasons at Ferris State University, scoring 35 goals and totaling 81 points in 147 CCHA games. Today we welcome friend of the blog and dedicated stat nerd Ross Bonander for his first of what I hope are many guest posts. Ross is a freelance writer in Austin and has written many books including "Hockey Talk - Quotations About the Great Sport of Hockey, From The Players and Coaches Who Made It Great". You can follow him on Twitter @Wolfgangus. Today he takes a deeper dive into the Stars statistics. Please note that these stats are very hard to just 'look up' and often there is a lot of manual work involved. This is dedication right here. When I tell you that I'm an engineer by trade and some of Ross's spreadsheet frighten even me, that should tell you about his dedication to numbers. Now 34 games into the 2011-2012 season, things look a little grim. At 15-16-1-2, our 33 points has us six points out of a playoff spot. Fortunately there's lots of hockey to go. To that end, here are some stats. We average 3.0 goals per game. Our opponents average 3.1 goals per game. No surprise then that when we score 4 or more goals, our record is 9-1. It would have been 10-0 but for the Rockford come-from-behind this past weekend. An asterisk (*) indicates a franchise record. By the way, the team record for fewest shots taken in a period is zero—the second period during the seventh game in team history, a 4-0 home loss to Lake Erie. With two referees calling the game, our record is 8-2. Dating back to the November home game against Houston (the Teddybear toss), a span of 19 games, we have held the opponent scoreless in the first period in just 3 of those 19 games, including goals in the last ten straight games. In 8 of those 19 games (and 5 of the last 10), we allowed 2 goals in the first period. Philip Larsen's 4 assists against Peoria on October 22 broke the previous record for assists in a single game (3, held by Brad Lukowich, Greg Rallo, Dan Spang and Maxime Fortunus). Larsen's effort also tied the team record for most points in a game (4, held by Greg Rallo). In that same game, Travis Morin scored a goal and 3 assists, adding his name to the record. On December 17, Ryan Garbutt's 2 goals and 2 assists against Rochester made the regular season single-game point record a four-way tie. Tomas Vincour scored a goal in five straight games, from October 27 through November 6, tying the previous record held by Warren Peters. Matt Fraser's 10-game point scoring streak (7 goals, 5 assists), from December 3 through December 29, set a franchise record, breaking Aaron Gagnon's 8-game streak (3 goals, 6 assists) set from October 23, 2009 through November 11, 2009. Travis Morin's first assist against Houston on October 14 gave him 99 career points, passing Greg Rallo (98) atop the all-time list. Matt Fraser currently has 19. Travis Morin currently has 28. Matt Fraser currently has 9. Francis Wathier and Colton Sceviour each currently have 9. Francis Wathier currently has 6. The Stars have played 96 regular season games at the CPC dating from October 3, 2009 through January 8, 2012. After all those games, the home crowd is STILL waiting for the first Texas Star to register a regular season Hat Trick at the CPC. The only Stars trick we've been treated to came off the stick of Jamie Benn in game 5 of the Division Championship series against the Chicago Wolves in 2010. Fraser's been close three times. Garbutt and Glennie, once each. Just some short roster notes today as the Texas Stars released Ian Lowe and Jimmy Spratt from their PTOs. Both will return to the Idaho Steelheads of the ECHL. Prior to the game, Texas released goalie Jimmy Spratt from a PTO (professional tryout agreement). Spratt played in two games for Texas, going 1-1-0 with a 2.02 goals against average and a .909 save percentage. Spratt is a third-year pro who started the season with the Idaho, going 5-5-0 with a 2.95 goals against average and a .920 save percentage over 12 games. He split last season between Toledo and Victoria of the ECHL, as well as Rapid City of the CHL. In all, Spratt made 20 appearances, going 9-7-1 with a 3.91 goals against average and a .873 save percentage. The Calgary Flames drafted the 26-year old in the seventh round (#213 overall) of the 2004 NHL Entry Draft. The Texas Stars announced on Monday that the team has released forward Ian Lowe from a PTO (professional tryout agreement). Lowe suited up in six games for the Stars from Dec. 27 – Jan. 8, failing to register a point in his time with Texas. 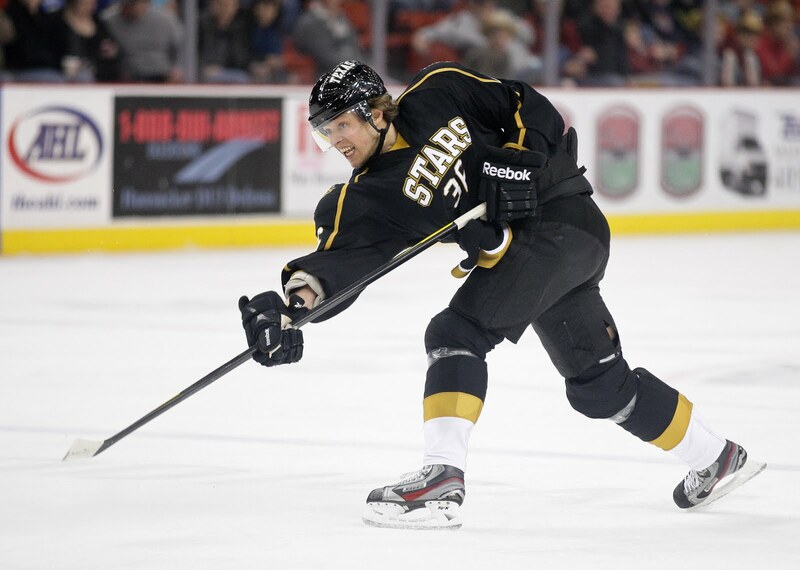 The rookie forward played the first 30 games of his pro career with the Idaho Steelheads, Texas’ ECHL affiliate. The 5-foot-9, 175-pound center was third on the team with 12 assists and 19 points at the time of his recall. The 24-year-old played the last four years at Bemidji State University from 2007-11. In 142 WCHA games, Lowe netted 37 goals and set up 42 for 79 collegiate points. In a back and forth contest in which neither team ever led by more than one goal, Texas fell to Rockford this afternoon 6-5 in overtime. Texas scored three power play goals but allowed a shorthanded tally as well. The penalty kill was flawless until the overtime period, in which they allowed the game-winner. Scott Glennie picked up two goals and an assist in the game, and Brad Lukowich finished off a strong weekend with a goal and assist of his own. Coach Pyle felt like the team played hard enough to win. "We scored five goals at home; we should win," he said. "With injuries, we don't make excuses. We just come out and battle hard every day." Texas opened up the scoring with Glennie's fifth of the year slipping past Hutton on a scramble play in front. Rockford tied things up just two minutes later off a point shot that found twine. Just over a minute after than, Ben Smith pushed the Hogs ahead on the game's 8th shot. The Stars rounded out the period with a power play goal from the captain. Lukowich's third of the year and second in as many games made it clean from the point to the back of the net. Texas opened the second on the power play, but it was Rockford scoring the goal on the penalty. Former Star Brandon Segal beat Brenden Dillon down the left wing side to pot his twelfth of the season. It was a tough break as it looked like Segal would not get the shot off due to Dillon's defense, but ultimately did, beating Beskorowany on the far side of the net. The Stars roared back on the power play at the midway point of the game. Matt Fraser was first, scoring his team leading 19th, to tie things at three all. Ryan Garbutt went next, falling down as he scored to make things 4-3. Texas would finish the second up by one in the track meet of a game. Rockford got the better of Texas in the third. Dylan Olsen's point shot also made it through to tie things at four three minutes in. Scott Glennie continued his excellent night, however, beating Carter Hutton coming down the right wing side for a 5-4 lead. With the clock running down, Rockford got the equalizer. In a scarmble in front of the net, it seemed like Tyler Beskorowany had the puck covered. It popped free to pugilist Rob Flick, who scored his first of the season. "We've got to find a way to find that puck. In that situation, we expect that puck to be had." With overtime imminent, Texas had a fateful penalty call. With just 2.2 seconds remaining, Ryan Garbutt took a slashing call. It was the easiest possible call to make for the referees, as the Rockford blue liner's stick snapped in two on the play. "I was really disappointed with Garbutt for that penalty he took. He's been taking a lot of stupid penalties. Two seconds left in the game, that's not being a team guy. That hurts all of us." The Stars would take it to overtime, with Francis Wathier practically sitting on the puck in the faceoff circle to kill the clock. In OT, the always dangerous 4-on-3 PP did work. Travis Morin was taken out of the play on what looked like a trip and Rockford had a 4-on-2 advantage, leading to Brandon Pirri's 15th of the season and the game winner. The Stars are in action again on Wednesday against the Abbotsford Heat before hitting the road for four games, including a weekend set against the Griffins and Admirals. Dan Spang was a surprise scratch this afternoon. The team indicates he is out with a minor upper body injury. "I've gotta think he's OK [for Wednesday]," said Coach Pyle. "Better safe than sorry." No word on the condition of Scott Glennie, who took a hard hit in the third and skated off immediately. He came out for a few shifts afterwards but ultimately sat out most of the back half of the third. He was seen testing out his left knee on the ice after the hit. Texas welcomes the Rockford IceHogs back to the Cedar Park Center for a second game in a row against the club this afternoon. Today's matinee game is only the second such game of the season for the Stars, who won their only other matinee 7-0 over the Barons in the season opener. Texas and Rockford are both finishing up three-in-threes today, so today's game might be a little sluggish. Texas saw Rockford last night and they have some similarities between the two clubs. It was clear that Rockford has talent on the ice, but it's been a season of bad breaks and tough bounces. In the third of last night's game, the Hogs had at least three chances at a wide open net with Raycroft sprawled out and missed or didn't get a shot off. They are dangerous, but something just isn't clicking for them this season. The Stars should look to their power play to contribute again. Third day legs can lead to lazy penalties, which can generate opportunities. If the Stars cash in, they can set themselves up for a solid win before Abbotsford comes to town on Wednesday. The same is true for Rockford though, so Texas needs to play smart. Expect Tyler Beskorowany in net tonight as Jimmy Spratt will be returning to Idaho today. Two power play goals and a clean sheet on the penalty kill helped Texas to a 4-2 win over the Rockford IceHogs tonight in Cedar Park. "Tonight we finally got some power play goals," said Coach Pyle. "I thought we played really well, weathered the storm in the third. They're a tough team to shut down." The Stars captain, Brad Lukowich, chipped in a goal and two assists, earning him the #1 Star of the night. "I've really been focusing on putting my game in place and leading by example," said Lukowich. "It's about leading and showing that hard work and effort." Colton Sceviour followed that example with a three point night of his own. 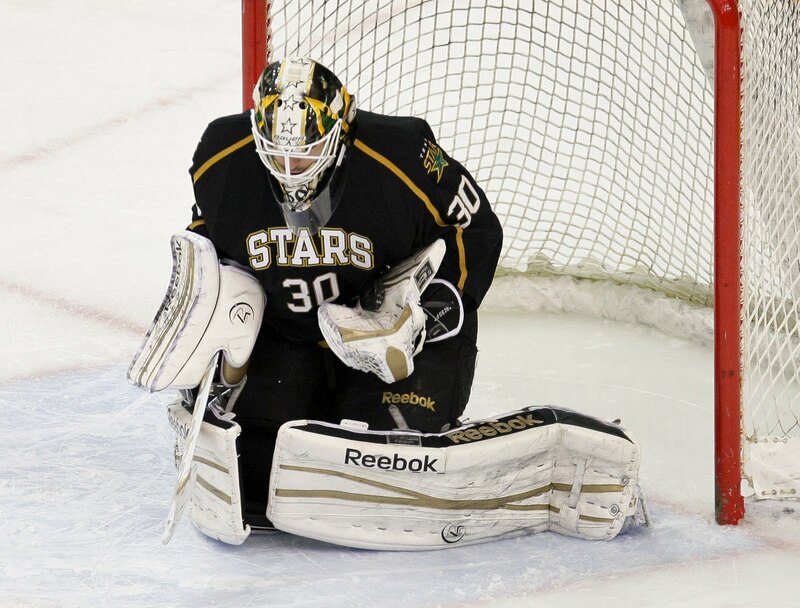 Andrew Raycroft, in his second AHL start of the season, collected the win with a 25 save performance. The Stars gave up an early marker to the Hogs just three minutes in. A wonky bounce put the puck to the top right corner of the net, beating Raycroft, who was squared to where the puck should have gone. The bad luck goal was Jeremy Morin's 6th of the season. Texas's power play came to life against the last place Rockford PK this evening. Francis Wathier went first, tipping a Brad Lukowich point shot past Alec Richards for the tying goal. The first Stars PP unit had been humming the entire shift and was amply rewarded with the goal. Sceviour picked up the second assist. Ryan Garbutt added another PPG on a slow dribbler to set the score at 2-1 to end the first. The Stars would not relinquish that lead in the game. On the power play's great night, Lukowich pointed to familiarity, "It's one of those things where you're unfamiliar with different guys with guys going up and down. Today we went back to the guys that were together for the last couple of years. They put me back with Wathier, Sceviour, Max [Fortunus], and Scott Glennie in Rallo's spot." Lukowich opened the second with his second goal of the season, another point shot with Wathier setting the screen. Rockford collected their second of the night in the period as well with Youds beating Raycroft with five minutes left in the period. That set up for a tight third period. After totalling 50 shots in the first two periods, Rockford and Texas combined for just 8 in the third. It was lockdown hockey for the Stars, who only allowed two shots. 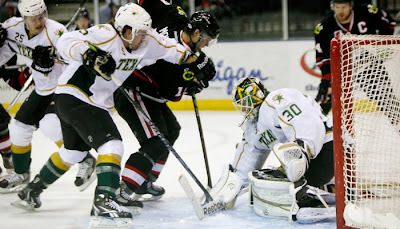 Texas finishes their three in three with their final home game against the IceHogs this season tomorrow at 5 PM. Expect Tyler Beskorowany in net for the Stars after Raycroft collected two starts this weekend already. This was the second straight game for rookies Coyle and Labrie to be paired together. Each was minus-1, being on the ice for Rockford's second goal. "It's a huge opportunity for them and they've stepped up," said Lukowich. "We're not nervous having those guys on the ice." "It's good that the young kids get to play a little more," said Pyle. "It's win-win."